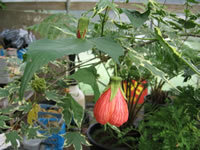 The Flowering Maple can be grown outdoors in warmer regions (Zones 8-10), but it is most often grown as a house plant. The Flowering Maple is not really a Maple at all. That common name is derived from their maple-shaped leaves. but they will often flower periodically through the winter as well. The flowers differ with each species, but generally resemble a cross between a Hibiscus and a Hollyhock, with colors ranging from white to reds, yellow, orange or several shades of blue. The foliage is usually a pale green, but there are also variegated forms with white or yellow mottling. In addition to needing filtered sun, Flowering Maples grow best when kept at about 70 degrees F. during the day and 60-65 degrees F. at night. They require a well draining but evenly moist soil. Flowering Maples benefit from being kept outdoors in filtered sun during the summer months, but must be returned indoors before frost. Be sure to check carefully for harmful insects, when you bring it back indoors! During the winter, when growth has slowed, the soil should be allowed to dry out between waterings but never allowed to remain dry for too long. Humidity is not too great of a concern except during the winter months when it is helpful to give your plant an occasional misting. Feed your plant monthly when it begins showing signs of new growth, alternating between an all purpose (20-20-20) and a bloom type (15-30-15) liquid fertilizer applied at half strength. so you will need to 'live and learn' to find the right frequency of feeding. but only into a slightly larger pot unless you want to drastically increase the size of your plant. Flowering Maples need a considerable amount of room in which to grow. so it is important to not provide too large of a planter, nor to feed this plant too well. When your plant has reached a suitable size you can control the growth somewhat by pinching, pruning and keeping it slightly root bound. 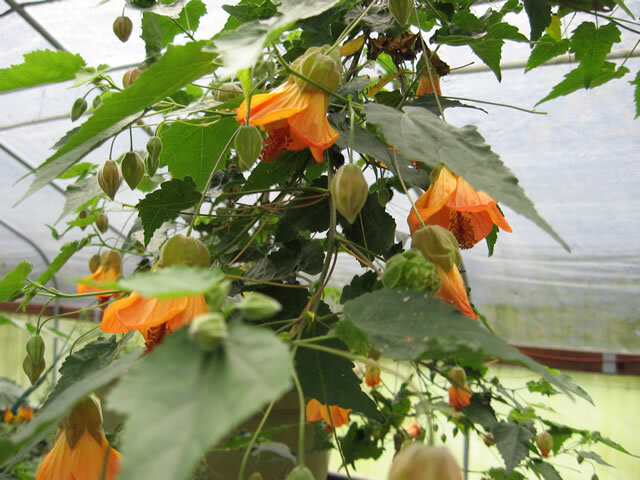 Abutilons can be grown from seeds which will germinate in 21 days when kept at 75 degrees. Seeds started indoors in early spring should be ready to produce their first flowers by the following winter. Additional plants can also be cloned by softwood cuttings taken at any time of the year. Cuttings will produce roots much sooner if bottom heat is available.